Road riding is a wonderful thing. Many riders who ride on the roads enjoy being able to walk out their front door and going out to explore the world. 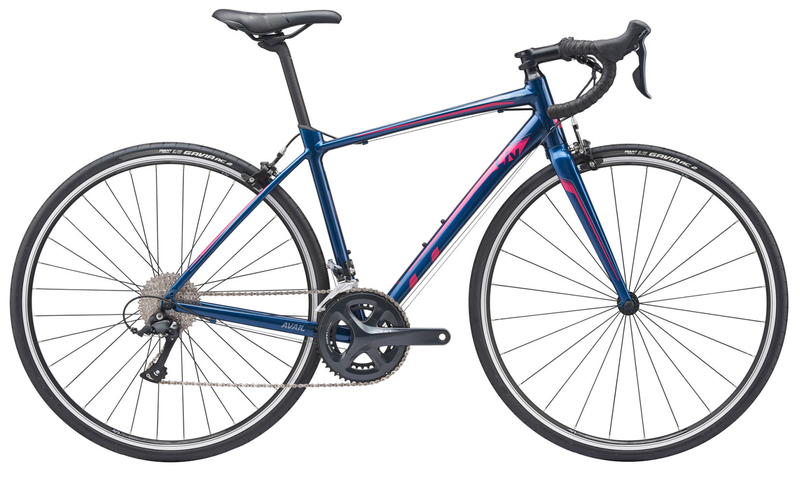 The 2019 Liv Avail 1 Bike is a lightweight road bike that is comfortable and built for female riders. The frame geometry is built for endurance riding and the Sporting OverDrive and PowerCore technologies provides superior stiffness without compromising compliance. The Avail 1 comes with a Shimano Sora 2x9 drivetrain that provides an excellent gear range so riders can climb efficiently and accelerate on the flats. Sora shifts reliably and smoothly. The Tektro rim brakes are lightweight and provide ample stopping power. The Avail 1 comes with top bar brake levers which means you can ride with your hands on the hoods or ride with your hands on the top of the bars and still be able to brake. 153 - 162 cm 5'2" - 5'7"
158 - 169 cm 5'5" - 5'9"
165 - 174 cm 5'7" - 6'0"